From its beginnings as a pestilent port and colonial backwater, Hong Kong became the "pearl" of a declining British empire, and then ascended to its present status as a gleaming city of commerce. Throughout its history, Hong Kong has been steeped in drama, intrigue, and seismic social shifts. Shih Shu-ching, an acclaimed Taiwanese writer, sets her epic tale of one beautiful and determined woman's family amid this rich and colorful history, capturing in vivid, panoramic detail the unique tensions and atmosphere that characterize the city. Critically praised and long popular in the Chinese-speaking world, City of the Queen is now available for the first time in English. After being kidnapped from her home in rural China, Huang, the novel's heroine, is brought to Hong Kong and sold into prostitution. Thanks to her shrewd, sometimes devious business dealings and unexpected twists of fate, she emerges from these cruel beginnings to become a wealthy landowner. 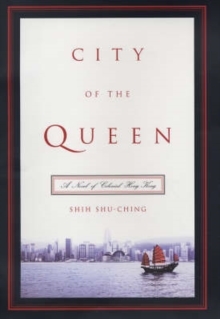 City of the Queen follows the fortunes of Huang's family, including those of her devoutly Christian daughter-in-law, who tries to redeem the sins she believes Huang has committed; her grandson, who becomes the first Chinese judge on the Hong Kong Supreme Court; and her great-granddaughter, a quintessential Hong Kong young woman, who turns her back on family tradition to revel in the pleasures offered by the 1970s and 1980s metropolis. The novel introduces a range of other Chinese and British characters, examining the complicated relationships between colonizer and colonized in a searing and perceptive portrayal of colonialism. There is Adam Smith, the British officer who struggles with the competing seductions of Huang's beauty and British respectability; Qu Yabing, Smith's servant, who despises anything Chinese, yet becomes Huang's lover after she is abandoned by Smith; Colonel White, the sadistic colonial police chief; and Auntie Eleven, a concubine who owns a pawnshop and teaches Huang the secrets of the trade. * Variable discounts between 0% and 15% are applied to items where BBfS cannot determine exact discounts from suppliers.